I had the pleasure of being interviewed by Swiss Radio channel RTS (Radio Television Suisse) today. Based in the French speaking part of Switzerland, in Lausanne to be precise, Lois Siggen Lopez runs a weekly radio cast on start-ups from Switzerland. Lois came up with the point that Swiss start-ups usually lack the global approach as they mostly think too much on becoming successful in Switzerland only. I share his point of view to a certain extent, however the example of Doodle shows, that there are digital applications that make it beyond the Swiss border. While Lois is highly successful with his podcast himself, he shared his vision with me: in a few months (or years) he wants his category ‘Neophiles’ to be part of the broadcasting mainstream in Swiss media, just like international news, the business or sports section. I can fully support this vision, let us help the Swiss start-up scene become mainstream in the mindset of local and international listeners. 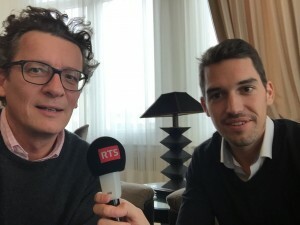 And here you’ll find the link to the interview on rts.ch – néophiles.